Starting your new pets off properly will set the foundation for their future health. There are many things that go into maintaining health at such an early age. Things such as genetics inherited from the parents, in-utero health and the mother’s health during the pregnancy are all influencing factors, but not ones that you can control as the new puppy or kitten owner. Things such as parasite control, vaccinations, nutrition, exercise and socialization are all things that you can control. As a basic rule, young puppies and kittens are dewormed frequently through the first few months of life to ensure that parasites do not develop in their bodies and contribute to health problems such as diarrhea, malabsorption, intestinal damage, poor or stunted growth, weight loss or respiratory problems. Did you know that parasites like roundworms can be passed from the mother to the offspring and then part of their life cycle passes through the lungs before finally ending up in the intestines!! There are many others, so bring your questions to us so that we can help develop a proper parasite control plan based on your pet’s specific needs. Nutrition is one of the most important aspects of your new pet’s health. You are what you eat….right? There are so many puppy and kitten foods to choose from, so which one is the best? There are too many foods to name specifically but our basic recommendations are to choose a food with meat as the first (or first few) ingredients, stay away from food that have a lot of grains, by-products, fat, sugar and different colors, shapes and sizes. If you see these kinds of things, it is usually going to be a poorer quality food. Read our nutrition section for more information. 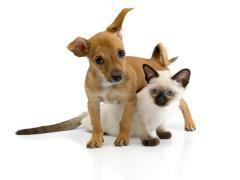 Socialization and exercise are also very important for your new pets. If they are not able to move around and interact with other animals and people, they will often times start getting into trouble for digging, tearing up things in the house, showing other types of destructive behaviors, barking, or soiling in the house. There are good trainers around the Olathe and Kansas City area, so if you are experiencing problems or just have general questions, let us know and we can point you in the right direction as well as offer our suggestions to the most common puppy and kitten questions. Have fun with your new family member! What do they need the most? Love, play time, good nutrition, training and good health care! The more you do with your new friend at an early age, the more at ease they will be the rest of their lives. This will also ensure that they become a part of your family that everyone looks forward to seeing! Please feel free to give us a call if you have questions or concerns.